Our classic - explosive four player fun! Two to four players can chase each other through eight different levels. For three and four player mode, you need our 4 Player Interface that you can order from our store - or you can build it yourself. Features of the game include mean remote bombs that you can leave somewhere and detonate later when another player gets close, kickable bombs, tubes to hide in and very explosive mushrooms. 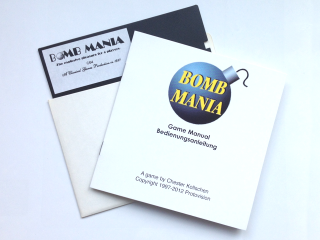 Bomb Mania comes with disk and optionally also with manual. More infos and a playable demo version on our product page. This Product was added to our catalogue on 29/05/2016.